When the German-born John Jacob Decker left his job with the Bradbury piano manufacturing company in 1856, he and his brother invested their life savings of $4000 to set up a new firm. Before long Decker Brothers’ square pianos were ranked among the best in the industry. By the end of the Civil War the firm’s business was such that they required a building of their own and in 1869 commissioned Leopold Eidlitz to design an elaborate building on Union Square. Here the fashionable residential area was just beginning to give way to commercial interests. Sitting among the brownstone residences, Eidlitz’s four-story building stood out in stark contrast. Its multi-colored façade with Venetian arcades and fanciful Victorian Gothic detailing was, at the very least, nonconformist. Pianos at the time were highly popular parlor fixtures. Well-bred young girls were necessarily schooled in piano and after-dinner recitals were de rigueur. Every household that could afford a piano had one; and the absence of the instrument mutely spoke of the family’s financial condition. Years later in 1919 Music Trades magazine would remember that Decker Brothers “was always included in the first five or six manufacturers of pianos of distinction.” That reputation and success necessitated a larger building and in 1892 the brothers hired the architectural firm of Alfred Zucker to design a new headquarters. Colorful and controversial John Edelmann was given the project. Edelmann was an outspoken anarchist whose radical viewpoint resulted in his expulsion from the Socialist Labor Party. He was not only a friend, but a mentor to the fledgling Chicago architect Louis Sullivan. 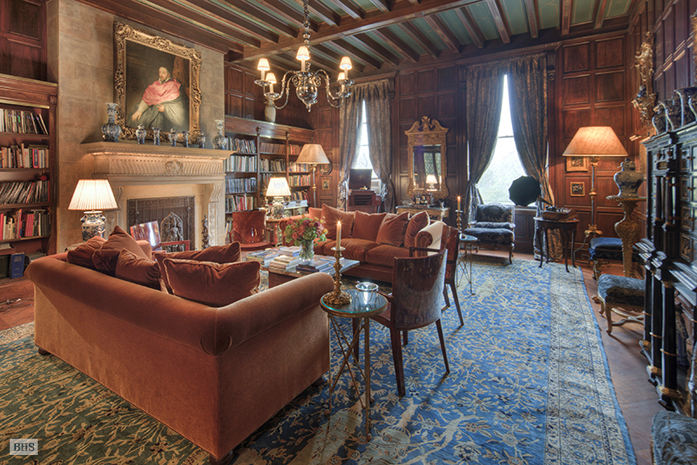 Working with a narrow plot – the 30 foot width of the original brownstone house that the Deckers razed for their first building – Edelmann’s design outdid the Venetian fantasy he replaced. Completed in 1883, it was an amalgamation of Venetian and Moorish elements with balconies, exuberant terra cotta panels of Islamic motifs, cast iron filigree and, topping it all, a domed minaret. Decker Brothers occupied the first two floors with the great expanse of glass for their “piano rooms.” Alfred Zucker moved his offices into the top level and the intermediate floors were leased out. The building rose 11 floors, making it the tallest building on the Square. George W. Shiebler & Co., silversmiths took over the third floor, which The Jewelers’ Circular and Horological Review called “one of the most perfect business lofts to be found in that section of the metropolis.” The sales room was fitted out in mahogany, in the rear were offices and counting rooms and a “hotel room” for visiting wholesale buyers. Behind these were the packing and polishing departments. Other early tenants included The Globe Review, a quarterly review of “literature, society, religion, art and politics” – in short everything. In 1894 the National School of Electricity established its headquarters here and in 1897 theatrical manager Joseph Arthur had his offices in the building. In 1902 the advertising agency George Ethridge Co. started business in one room on the 7th Floor. Business boomed and two years later the firm took nearly the entire 9th Floor. The Women’s Municipal League set up its headquarters here in 1903 and architect Arnold W. Brunner moved in a year later. A threat came to the Decker Building in 1902 when ground was broken for the foundation for architect Bruce Price’s Bank of the Metropolis. The deep foundation necessary to uphold the new bank building meant that the Decker foundations would be undermined. If remedial actions were not taken, the Decker Building could face collapse. The entire south wall – weighing 76,000 pounds per foot – was lifted 1/8 of an inch and placed on double tiers of massive steel beams. The shallow foundations were then blasted out and deeper ones were build on the bedrock. It was, at the turn of the century, an engineering marvel. 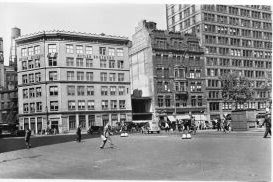 Renowned artist Isabel Bishop had her studio on the 4th Floor beginning in 1934, remaining here until 1978 painting and drawing inspiration from the much-changed Union Square below. More notable than Bishop, however, was Andy Warhol who moved his studio, called the “Factory,” to the 6th Floor in 1968. It was here on June 3 that same year that playwright Valerie Solanas waited patiently for Warhol and art critic Mario Amaya to return. When they did, Solanas shot them both, hitting Warhol three times. Solanas, who felt Warhol was attempting to wrest a screenplay from her, surrendered to police shortly after. She was sentenced to three years in prison. Warhol remained in the Decker Building until 1974. By the time the Windsor Construction company purchased the building through foreclosure in 1994 it had been sorely abused. The elaborate storefront had been obliterated, the fanciful minaret had long ago disappeared and the balconies had been stripped away. While they planned a conversion to residential use, the firm commissioned well-known preservation architect Joseph Pell Lombardi to restore the façade. Lombardi replicated the first floor where Decker’s pianos were once proudly on display and reconstructed the missing balconies and other details. Although it was part of restoration discussions, the minaret did not make the final plans. The only Edelmannn structure to survive in New York City, the Decker Building now has commercial space on the first floor and 18 residential units above. It stands as a remarkable example of fanciful Victorian architecture, a true gem on Union Square. ﻿In the dawning years of the 20th century, Robert Irving Jenks was living in a respectable, four-story brownstone residence at 35 East 65th Street. Just steps from Madison Avenue, it was in the developing fashionable neighborhood where New York’s wealthy, in their constant northward migration, were settling. The brownstone homes of the Civil War period like Jenks’ became passe as millionaires like Andrew Carnegie and James Berwind erected refined Georgian and Federal revival mansions. Following the trend Jenks commissioned the respected firm of Flagg & Chambers to design a new house a block away at 54 East 64th Street. Ernest Flagg produced a neo-Federal residence four stories tall over a shallow English basement. It replaced the traditional brownstone home previously owned by Josephine E. Nichols, similar to the those that still flanked it. Red Flemish bond brick was set off with white marble and black ironwork, and a wide set of four shallow steps spilled to the sidewalk from the double entrance doors. Above the cornice a brick-and-stone balustrade finished the design. While they were among the city’s moneyed set, the Jenks were not socially prominent. The financier, a graduate of Yale, joined an elite group of other bankers including Percy A. Rockfeller, H. O. Havemeyer and Charles Gates who schemed to start their own motorcar company in 1910. Each member invested $10,000 (almost $38,000 in 2011 dollars) in the company which would manufacture cars for the investors’ own use. The Orson motorcars were produced from existing parts – springs used in the Mercedes and the steel frame of the Fiat. Then, after the one hundred cars were manufactured – one for each investor – the company went out of business the following year. Jenks drove his very expensive, very exclusive Olson for several years. By the middle of the 1940s the Jenks house sat empty; a perfect spot for the growing Foundation’s headquarters. On September 12, 1947 renovations were completed. Rooms that once served as a library, dining room or sitting room were now offices. But the Foundation treated the architectural details with sympathetic respect. 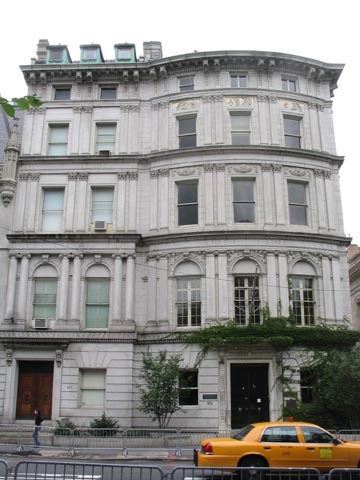 After four decades, the Foundation moved out, selling the building, perhaps unexpectedly, to Arthur L. Carter, founder and publisher of The New York Observer. The newspaper would call No. 54 East 64th home until 2004 – cramming telephones and desks into the ever-crowded space. As the newspaper grew, the space did not; and finally the opulent residence was sold to real-estate developer Janna Bullock. The new owner undid the half-century of office use, carefully renovating the space to be used as the Kips Bay Decorator Show House for a year. Then the 10,000 square foot home was sold to Derek Quinlan in 2006 for $18.75 million. Four years later Quinlan listed it for $36 million. Robert Jenks' dignified townhouse survives as an example of the Colonial Revival fad that swept the nation before World War I. Although the AIA Guide to New York City calls it “a minor Flagg,” it is a tasteful and essentially unchanged fixture on East 64th Street. In 2011 it remains on the market for $27 million. Things started out calmly enough for the priest. He was ordained in 1896 and, upon graduating from the Catholic University of America in Washington DC, he was sent to St. Joseph’s Seminary in New York as Professor of Psychology and Ethics. Duffy had been Army chaplain during the Spanish-American War and, after becoming pastor of Our Savior Catholic Church in the Bronx, was made chaplain of the 165th National Guard Unit of the 42nd Division – formerly the 69th Infantry Regiment – the year World War I broke out in Europe. And that’s when things changed for the Irish priest. The unit was dubbed “The Fighting 69th” by Confederate General Robert E. Lee and remembered in an Irish-American folk tune “The Fighting 69th” for its Civil War exploits. The 165th would always be the 69th to its soldiers. If officers expected the chaplain to wait passively for the soldiers to return so he could administer rites and dispense priestly wisdom, they were wrong. By the end of the war, Duffy was the most highly decorated chaplain in U.S. Army history – earning the Distinguished Service Cross and the Distinguished Service Medal from the U.S. and the Legion d’Honneur and Croix de Guerre from the French military. While on the front lines, Joyce Kilmer was writing the story of the regiment in battle. A year after the unit’s deployment, the writer was killed at the Second Battle of the Marne in 1918, at 31 years old. Father Duffy picked up Kilmer’s notes and finished the project. When the war was finally over, Duffy quietly returned to New York City to take up his duties as pastor of Holy Cross Church in Hell’s Kitchen, just a block from Times Square – a gritty area of mostly Irish immigrants living in poverty. He died on June 26, 1932. Almost immediately a movement was begun to honor the hero priest with a monument. On September 10, 1935 the Municipal Art Commission gave preliminary approval to a model of a statue designed by sculptor Charles Keck to be erected in the large, triangular traffic island in Times Square where Broadway and 7th Avenue intersect above 47th Street. The dramatic and powerful design depicted Duffy in the uniform of the 69th, helmet at his feet, holding a bible. Behind the soldier-priest a monolithic green granite Celtic cross rose. 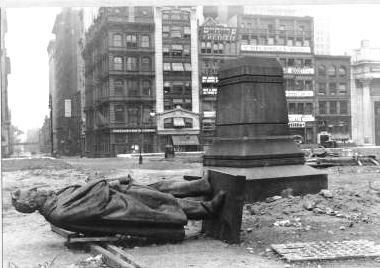 The monument was completed in the Spring of 1937 and as the city prepared for its unveiling, renowned photographer Berenice Abbot chanced upon the tightly-wrapped statue one day in April. The unusual subject was too much to pass up and Abbot began assembling her tripod and setting up the shot. Before long a curious crowd assembled to watch the photographer’s work. A Times Square beat cop was not as interested in her art. Berating her for causing a public disturbance he ordered her to move on. Abbott took one hasty shot and packed up. “I wasn’t smart about fighting back them,” she later lamented. Berenice Abbot's pre-unveiling shot produced a curious crowd and the ire of a Times Square cop. The finished bronze statue is nearly 8 feet tall and the green granite cross tops 17 feet. The traffic island on which it sits was renamed Father Duffy Square. Only eight years after it was dedicated, the statue was nearly lost when the city considered melting it down in 1943 for scrap metal for the war effort. 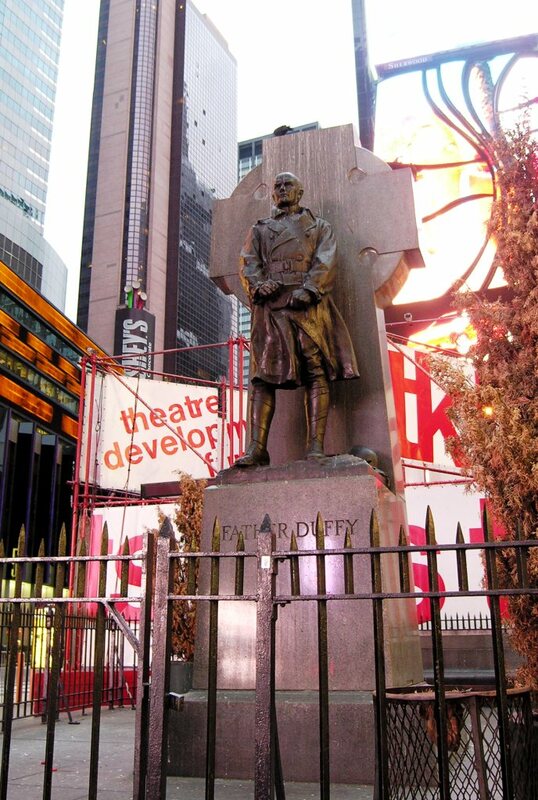 Father Duffy Square has seen dramatic changes since that Spring day in 1937 when the statue was unveiled. Throngs of tourists and New Yorkers alike pass the monument daily in bustling Times Square. The modern TKTS booth now forms the statue’s backdrop. The monument was restored in 1997 with money provided by the Times Square Business Improvement District when it was conserved and repatined. The powerful depiction of Duffy was included on the National Register of Historic Places in 2001. 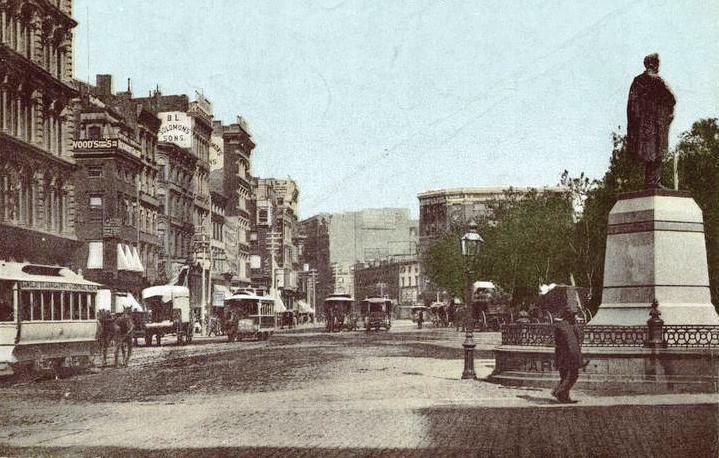 The Stuyvesant land covered much of what is now known as the East Village. During the 19th century what had been rolling farmland was developed with row houses, commercial buildings and tenements. After the Civil War, German immigrants crowded in, creating a lively and colorful neighborhood. In the meantime, Rutherford Stuyvesant married Mary Rutherford Pierrepont on October 13, 1863. She was the daughter of the prestigious and wealthy Henry Evelyn and Anna Jay Pierrepont of Brooklyn. Their lives together were happy and loving; but then on New Year’s Eve 1879, the expectant Mary went into labor. Neither Mary nor the infant survived. In deep grief, Stuyvesant planned a monument to his wife. He arranged to build a memorial chapel connected with St. Mark’s Church-in-the-Bowery, the Episcopal church built by Peter Stuyvesant in 1795 on his farm land. Stuyvesant chose a large plot of land at the corner of East 10th Street and Avenue A where a small St. Mark’s mission structure already stood. He hired the eminent architect James Renwick, Jr. who was already responsible for the magnificent Grace Episcopal Church and St. Patrick’s Cathedral. Renwick worked with W. H. Russell in creating an edifice far removed from those lacy Gothic churches. 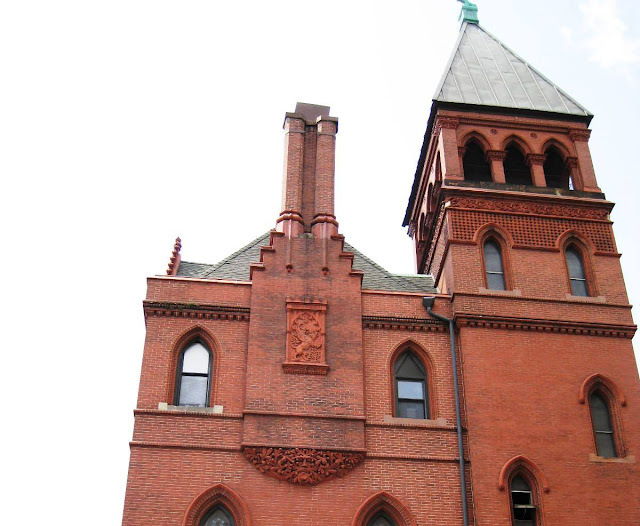 Begun in 1882, it was constructed of red-orange brick and abundant terra cotta trim of a nearly-matching hue. The building drew on several of the prevailing styles of the day: Romanesque, Gothic Revival, Renaissance Revival, Queen Anne and Eastlake. The great mass facing Avenue A was broken by stepped dormers, a multi-level roofline and terra cotta courses separating the floors. A dramatic Gothic entrance separated the chapel from the school and administrative sections. A tall, impressive bell tower rose above the roof to a pyramidal cap. The Avenue A side housed the classrooms and library. 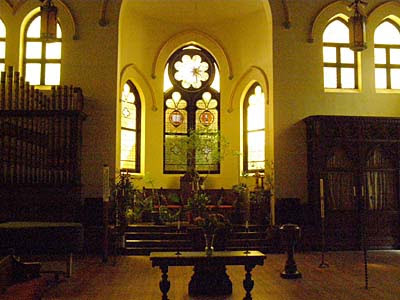 The chapel was immediately heavily involved in social and charitable works. It was home to the Guild of the Good Samaritan, which provided “physical air and medical attendance, etc., to the needy and sick poor in the neighborhood.” The Ladies’ Benevolent Society provided sewing for poor women, and the library with its 1,200 volumes provided free books. A Loan Relief Association was available when neighbors could not pay their rent, buy coal or medicine and other emergencies. Also here was the Parish Association that provided care and training of children, sought jobs for the unemployed and cared for the sick and aged. In 1897 the forward-thinking Rev. Dr. J. H. Rylance was rector at St. Mark’s Memorial Chapel. He closed the parochial school which took up two full floors because it “was found to be competing with the public schools.” He initiated the eyebrow-raising “pleasant Sunday hour;” a meeting in the library every Sunday afternoon with literary and musical entertainment. Ryland went on to introduce mothers’ meetings, boys’ and girls’ clubs, day nursery and a saving fund. The same year he had the chapel frescoed and painted and installed a modern heating system. A grotesque face peers from amidst intricate terra cotta foliage below a plaque of a lion, the symbol of St. Mark. The St. Mark’s Memorial Chapel would not enjoy the new paint job and heating system for long. By 1909 it had been taken over by the Holy Trinity Slovak Lutheran Church. On a cold January 4th, 1921 200 unemployed men marched north from the Bowery at the Manhattan Bridge. They formed two groups of 100 men each and marched in military formation, tattered and unwashed, towards East 10th Street. When they were stopped by a police officer, they explained there were merely “going to church” and he allowed them proceed. Upon arriving at the church, they found the chapel door open. The men marched into the main building and took up quarters in the gymnasium, reception hall and music room. With no jobs and no homes, they had no place to go. In 1925 the newly-formed congregation of St. Nicholas of Myra Church rented the building. Part of the American Carpatho-Russian Orthodox Diocese, it made Rutherford Stuyvesant’s chapel its home, finally purchasing the building in 1937. Large copper Orthodox crosses were erected on three of the gable peaks. In 1900 the wealthy and socially prominent Clinton Ledyard Blair began construction of his carriage house at 123 East 63rd Street. It was a busy time for construction for the financier and yachtsman. His enormous Louis XIII-style mansion, “Blairsden,” designed by Carerre & Hastings, was rising across the river in Peapack-Gladstone, New Jersey. The lavish home was begun in 1898 and would not be completed until 1903. 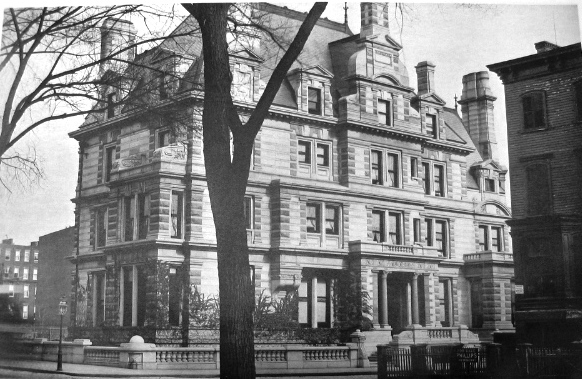 Blair and his wife, Florence, lived with their four daughters in a mansion at 5th Avenue and 70th Street – also designed by Carerre & Hastings. But for their new carriage house, Blair turned to the architectural firm of Trowbridge & Livingston who, while they would go on to design important buildings like the marble B. Altman and Company store and the St. Regis Hotel, were still establishing themselves. Blair gave the architects an unusual task. Not only was the building needed to house the Blair carriages; it would double as the studio of muralist and society portrait artist John White Alexander. Both Blair and Alexander were directors of the Equitable Life Insurance Company and both were trustees of the Metropolitan Museum of Art. Additionally, their wives were involved in many of the same charities. No doubt these connections resulted in the symbiotic plans for the carriage house. As construction got underway in 1900, Alexander returned triumphantly to New York from France on October 8 where he had been awarded a gold medal at the Paris Exposition for portraits; one of which was of Auguste Rodin. “His studio, which is in process of construction, is at 123 East Sixty-third Street,” The New York Times added as a side note. The carriage house and studio was completed in 1901 and it was a showstopper. The limestone and brick Beaux Arts structure sat on a rusticated base with a centered carriage door. Above a plain stone cornice, the second and third stories were faced in red brick with limestone quoins along the sides and a central limestone section serving as a base for a robust stone and wrought iron balcony under an ambitious stone hood. Alexander’s two-story sun-washed studio was at this level, rising into the mansard roof which was punctuated by two copper-framed oculi. The artist used this studio for his portrait work; for his mural painting he had a second studio in Carnegie Hall. 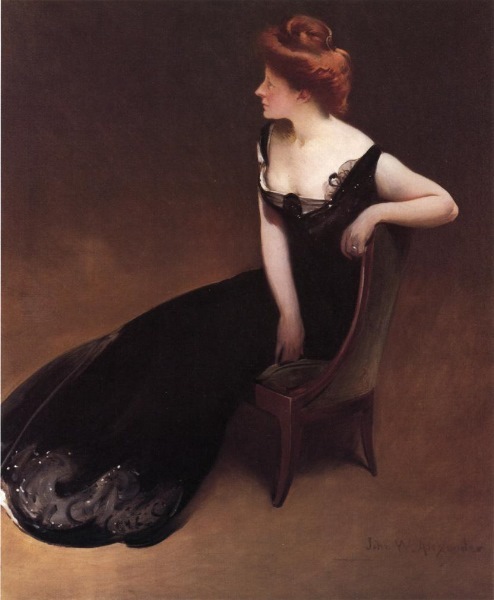 During the early days of the 20th Century a full-length portrait was a must for wealthy women and young, newly married socialites rushed to the studios of artists like Alexander, James McNeill Whistler, Thomas Sully and Howard Cushing. Mrs. Herman Duryea posed for her portrait in Alexander's studio. John W. Alexander died on May 31, 1915. Four years after Clinton Ledyard Blair died in 1949, the carriage house was purchased by the newly-formed Gurdjieff Foundation, Inc., a non-profit philanthropic organization, and converted to its headquarters. The ground floor became a private gymnasium with a library, committee room and trustees offices on the second floor. John Alexander’s studio was reborn as the Board Room and Conference Room. The lavish French carriage house stands essentially unchanged today. A remarkable example of the extravagant and elegant service buildings of the wealthy at the turn of the century. Arnold, Constable & Company sold to New York’s elite carriage trade from its marble palazzo on Canal Street during the middle of the 19th Century. In 1867, however, Aaron Arnold considered a move as the migration of the city’s wealthy slowly inched northward. 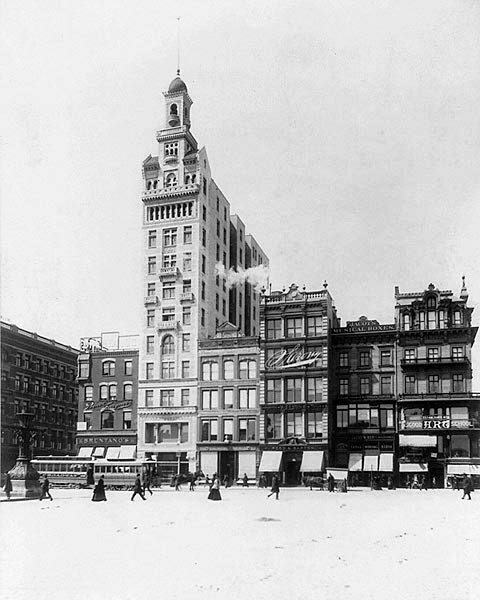 Thinking ahead of the other dry goods merchants, he purchased houses on the south end of fashionable Union Square on East 17th Street. A year later Arnold purchased additional homes, this time on Broadway at 19th Street and here he began building his extravagant cast iron Italian-style emporium that would far outshine his Marble House downtown. As the 1870s drew to an end, the other retailers had followed suit and Union Square area was lined with elegant stores such as Tiffany & Co. and Lord and Taylor. The Arnold family contracted German-born architect William Schickel in 1879 to design a commercial building for the East 17th Street site which would be leased out to various tenants. The resulting building was completed in 1881 at a cost of nearly $300,000. There was a retail store on the first floor with various commercial spaces above. 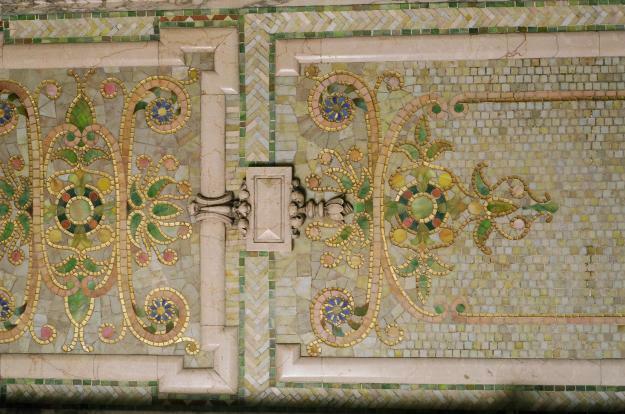 Schickel worked in the eye-catching Queen Anne-style. The style was much less common for commercial buildings than domestic architecture; but with its picturesque dormers and balconies, turrets and small-leaded windows, was raging across America for family homes with wrapping porches on sweeping lawns. Schickel successfully transposed the style into his building, using fish scale shingles on the gambrel roof, terra cotta panels with garlands and shells, and imposing chimneys on either end of the roof. A two-story oriel window added dimension and interest. Constructed of red brick trimmed in Wyoming bluestone, the building formed an L through the block with another, less impressive, façade on 18th Street. When they hung a large sign below the cornice announcing the firm’s name, the building quickly became known as The Century Building. The ground floor store and the cellar were taken by Johnson & Faulkner’s high-end furniture store. Worthington & Smith, milliners, moved in on a higher floor as did the haberdashery firm Earl & Wilson, sellers of men’s shirts, collars and cuffs; and publisher Thomas Nelson & Sons which printed the Nelson’s Series of Teachers’ Bibles. By 1887 the well-regarded architect George B. 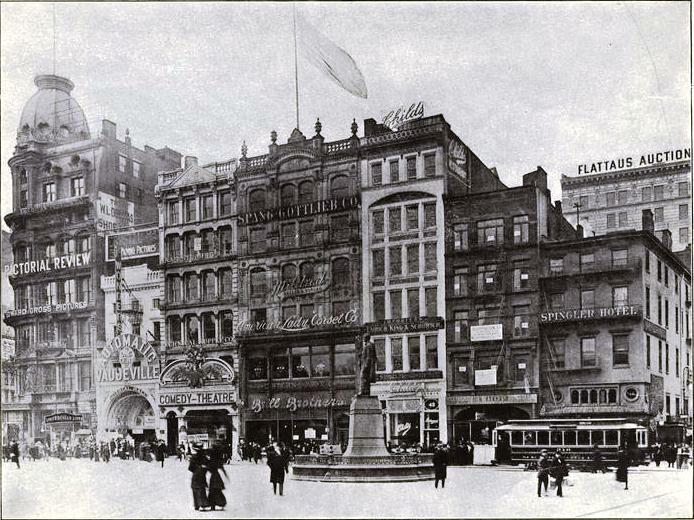 Post had his offices in the building, holding the committee meetings to erect the memorial to architect Richard M. Hunt here in 1899. The tenants complained to the Arnold family in 1886 when G. W. Alexander’s book binding firm took up space on the top floor. The danger of fire, they complained, was too great with the many flammable materials needed for the work. Their protests went unheeded. Then on July 7, 1888 a workman left a gas jet burning beneath a glue pot when he left for home. The glue boiled over, ignited, and set the floor ablaze. The floor burned through and the fire spread through Century’s offices. By morning the top floor and roof were totally destroyed and the firefighters had broken through every ceiling in the building to prevent the massive amounts of water to collapse them. In the cellar, where Johnson & Faulkner stored much of their furniture, was four feet of water, Century’s editorial and art rooms were gutted and their “elaborately decorated” offices were badly damaged. Johnson & Faulkner suffered $75,000 worth of ruined furniture, Earl &Wilson had about $25,000 in damages and G. W. Alexander about $55,000. The cost to repair the building was estimated at about $195,000. The fire caused scandal as well. Earl & Wilson employee John S. Little discovered two firefighters, John Murphy and William Connors of Engine Company No. 14, stealing shirts and collars after the fire was put out. Here in December 1893 the Century Company displayed the exhibit it had presented at the Chicago World’s Fair. In an effort to demonstrate “in attractive revelations of calm, decisive, nervous, and fantastic moods” of famous people, the firm displayed manuscripts – poems, letters, stories – by Lincoln, Grant, Oliver Wendell Holmes, Bret Harte, and others. It included the Lincoln and Douglas letters from July 24 to July 30, 1858; Lincoln’s letter of acceptance of his nomination of President dated 1860; his corrected copy of the inaugural address. There were plaster casts of Lincoln’s hands and face, Robert E. Lee’s pencil with which he corrected the terms of the surrender at Appomattox, the documents of Kennan’s Siberian expedition, 17th Century manuscripts and a raft of other historical relics. On August 9, 1903 another disastrous fire broke out, this time starting in defective electrical wiring on the third floor occupied by Baker & Taylor, wholesale booksellers and publishers. On the floor above was the Tavshanjian Rug Company and before long the fire burned through the floor and raged upwards, soon reaching Earl & Wilson’s shirt establishment. Firefighters had the blaze under control before it made it to the Century offices. 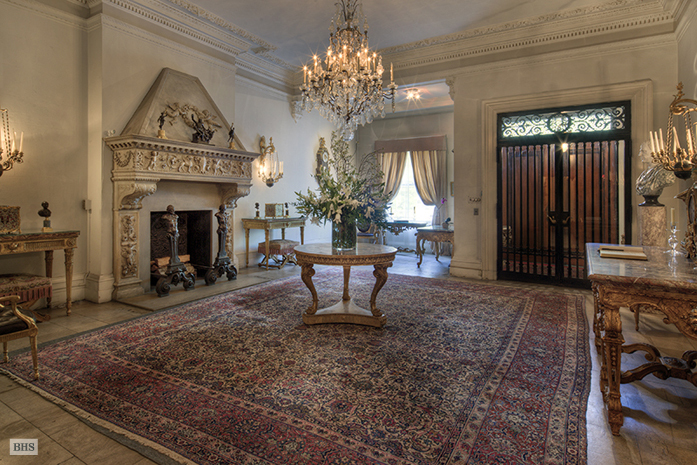 Tavshanjian’s stock – some rugs dating to the 16th century – was either burned or soaked. The firm estimated its losses at $55,000 the following day. Devastated, the owners held an auction the company’s entire stock within two months. It would be the largest sale in the history of the rug trade, amounting to just under half a million dollars. The Century Company left No. 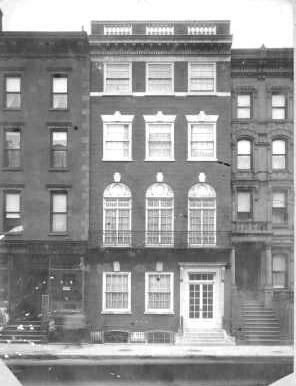 33 East 17th Street in 1915, moving to Fourth Avenue after 35 years here. Baker & Taylor left soon thereafter; however the old standbys of Johnson & Faulkner and Earl & Wilson – despite two damaging fires – remained on through the 1920s. While various tenants came and went, the building remained remarkably untouched. In 1913 a second row of dormers were added to the roof by S. Edison Gage and little-by-little may of the small-paned windows were replaced with large sashes. But the commercial space on the street level was astonishingly intact. 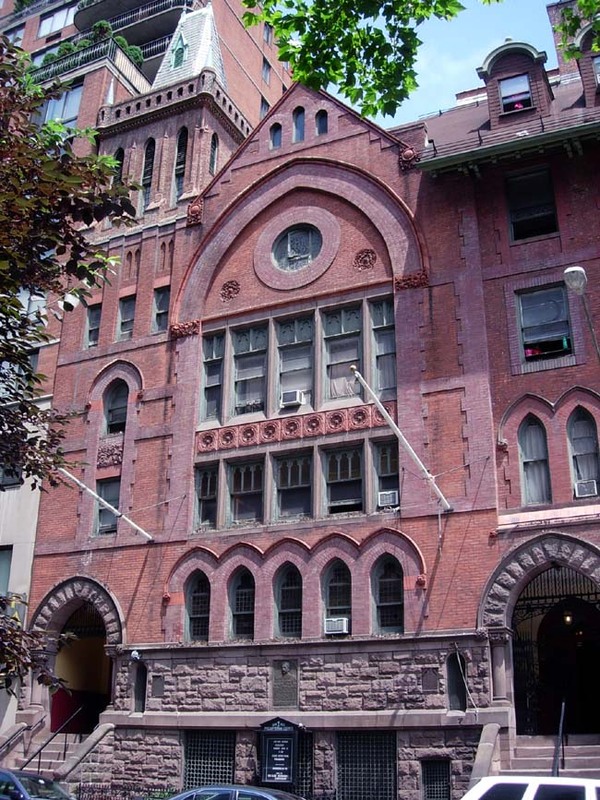 Although the Landmarks Preservation Commission designated the building a landmark in 1986, it was vacant at the time and remained empty for a full decade. Then in 1995 Barnes & Noble booksellers (appropriately) decided to move in. A full exterior restoration was initiated by architectural firm Li/Saltzman. The outstanding restoration of the façade and lobby won the 1996 Preservation Award for Restoration by the Municipal Art Society and the Victorian Society’s America’s Award for Outstanding Contribution to Preservation and Restoration. During the second half of the 19th Century, immigrants flowed into New York from Bohemia – the European area that would later become the core of Czechoslavakia. Hungarian-born Presbyterian minister Gustav Albert Alexy pulled together about two dozen Czech-speaking immigrants in 1874 and planted the seed for what would become the Jan Hus Church three years later. Unfortunately the Bohemians could not understand the Hungarian’s sermons. But it all worked out. Named after the 15th Century Czech religious reformer and martyr, the congregation had grown large enough by the late 1880s to build its own building. The Bohemian community was settling heavily in the Upper East Side and it was here, on East 74th Street between 1st and 2nd Avenues, that land was purchased for the new structure. Construction began in 1888 and was completed in 1891 at a cost of $50,000. Designed by R. H. Robertson, the church was on the cutting edge of religious architecture at the time. In 1915 the Church house, known as the Jan Has House, was completed in a remarkably complimentary style – a nearly seamless design. The adjoining land and $5,000 had been donated by an anonymous “American friend of the work.” After $6,500 was contributed by congregants and others, the Church Extension Committee of New York Presbytery appropriated the remaining $28,500 to build the six-story structure. Inside were classrooms, meeting rooms, “ample facilities for all the clubs,” living quarters for ten people, and the parsonage. A major problem with which the church had to content was the cavelier attitude of Bohemians towards organized religion. Their history of persecution resulted in most Czechs preferring to avoid organized services altogether. By now the Bohemian community in New York numbered 30,000 and according to the Presbyterian Church’s 1917 “The Church and the City,” the Jan Hus Church was “The only distinctively Bohemian Protestant Christian work carried on” among them. Yet the church had an active congregation of only 350 members, with over Sunday School 1,000 members. 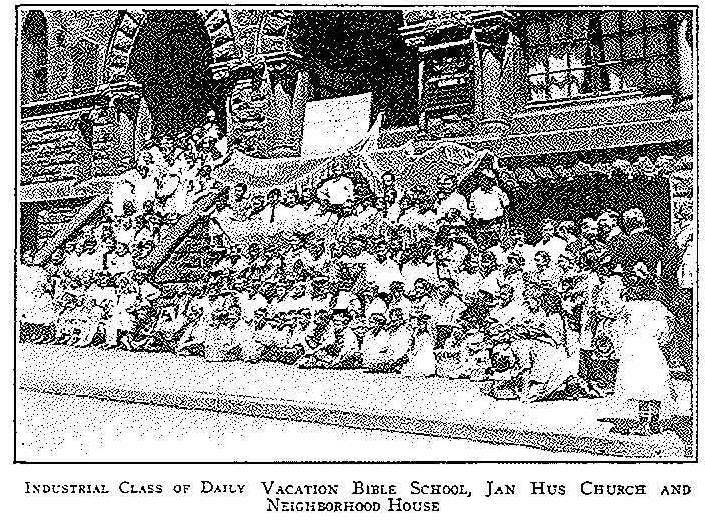 In 1922 Czech historian Kenneth D. Miller explained that of the then 6,753 Protestant Bohemians in New York City, “fully five thousand people claim the Jan Hus Presbyterian Church as theirs. This means that they were baptized or married there, or have at some time attended Sunday School there.” It did not mean they were weekly worshipers. Despite this, Jan Hus was one of the few self-supporting foreign language churches in the United States. On February 6, 1930 Reverend Dr. Vincent Pisek died in the parsonage after serving the church for 46 years; the oldest pastor in the Presbytery in continuous service at the time. Among his many contributions to the church and congregation, Pisek was proud to have married 11,582 couples and claimed that not one of them had divorced. 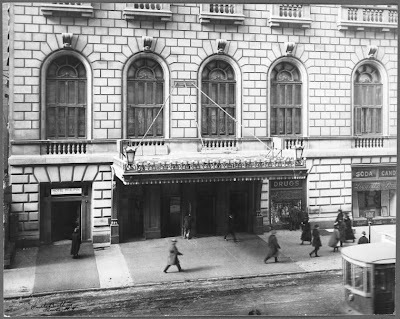 In 1952 the Jan Hus House became home to the Jan Hus Theater and the American Savoyards, which remained until 1967. Throughout the next decades the 150-seat auditorium saw performers like Barbara Streisand in The Insect Comedy, her first New York role in 1960. Troupes that performed here included LOOM (Light Opera of Manhattan), Chicago City Limits (a improvisation comedy team), The Remarkable Theater Brigade and the Czechoslovak-American Marionette Theatre Company. Renowned comedians like Paul Reiser, Brett Butler, Robin Williams and Jerry Seinfeld have hosted the Chicago City Limits Friday night stand-up. By the end of the 20th Century the masonry of Jan Hus Church was showing the effects of a century of use and weather. Burda Construction Corp. was hired to initiate an exterior restoration of the brownstone as well as reproducing many salvageable decorative stone elements. The “Little Bohemia” neighborhood has changed. Few Czech-speaking residents still walk the streets or attend Jan Hus Church. 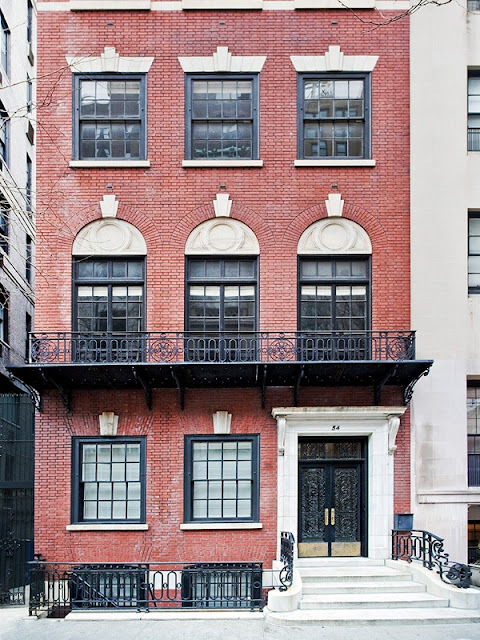 But Roberson’s bold, robust building remains a handsome fixture of East 74th Street and an integral page of Manhattan’s multicultural history. On Saturday July 1, 1911 the American Telephone Journal, Telephony, reported a most startling event. 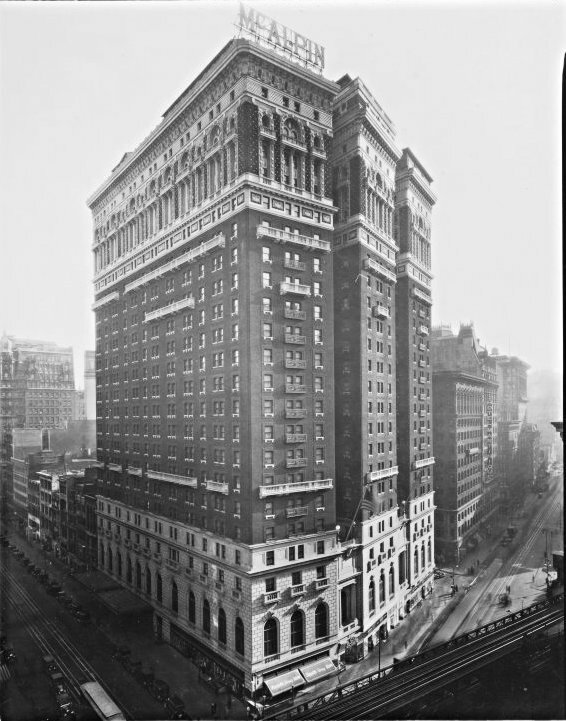 Frank M. Andrews, president of the McAlpin Hotel which was rising at Broadway and 34th Street, had just signed the largest telephone contract ever written. At a time when in-room telephones were essentially unheard of, the McAlpin would have 1800 phones. And modern it would be. The hotel was the brainchild of Frank Mills Andrews who envisioned not merely the largest hotel in the world, but the most innovative. Mills not only pulled together the investors, he founded and was president of the Greeley Square Hotel Company to operate the hotel. And he designed it. Among Andrews’ innovations was a fully-equipped miniature hospital “where cases, no matter how serious can be treated with exactly the same care as in the best up-to-date private sanatorium,” according to the Journal of the South Carolina Medical Association in January 1911. Situated on the 23rd floor so that the patients could enjoy quiet, it was outfitted with “every modern appliance known to surgery.” The surgeons and doctors who would staff the hospital were interviewed personally by Andrews. A Turkish bath and swimming “plunge” were planned for the 24th floor – unusual in that most such baths were located in basements with no circulation of fresh air. One floor was reserved for single women traveling alone. To prevent their being harassed, there was a separate check in desk on that floor, staffed by women, so the delicate traveler could circumvent the main lobby. All employees working on that floor were female. And, to be fair, the 22nd Floor was designated for male guests only. Included on that floor was a clubroom with card tables and a bar. He continued to think outside of the box by designing retail spaces opening on to the sidewalk – a startling and financially-advantageous novel idea. The land on which the hotel rose was owned by the McAlpin Estate, hence the name, and the stockholders included esteemed names like Charles P. Taft, brother of the President of the United States, and General T. Coleman du Pont. Andrews created an imposing 25-story structure that dominated the neighborhood at the time. Sitting on a four-story base of “Bedford stone,” it rose as three side-by-side wings of buff-colored brick. 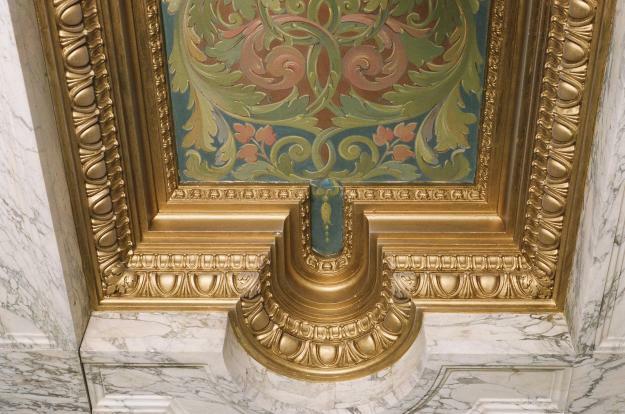 The top-most floors were embellished with colorful, eye-catching terra cotta. Costing $13.5 million – or approximately $308 million today – it was reportedly the largest hotel in the world. With a staff of 1,500 it could accommodate 2,500 guests. The hotel was completed just prior to New Year’s Eve, opening on December 30, 1912. 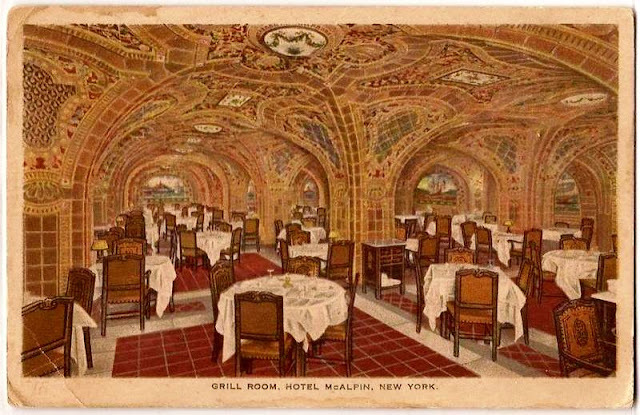 Intending to provide “first-class accommodations at moderate prices,” according to Good Lighting and the Illuminating Engineer magazine, the room rates ranged from $1.50 to $5.00 per night. Inside, the architect did not disappoint. The Italian Renaissance-style lobby, the largest in the city, rose three stories and was executed in marble and Caen stone. Arched openings were supported by Breche violet marble columns and the spaces between the arches were decorated with mural paintings by T. Gilbert White who had decorated the New Haven courthouse and the Kentucky Statehouse.. The paintings represented jewels, depicted as female figures, each dressed in the color of the gem she portrayed. Also on the first floor were the ladies’ reception room and the men’s bar and café (designed in 15th Century Italian Gothic with walnut paneling and a vaulted ceiling). Looking down onto the main lobby was the second floor Tapestry Gallery. Here 26 tapestries from the Herter Looms were hung, depicting the military history of New York. Art critic Helen Henderson called them “important as examples of American tapestry.” Before being hung at the McAlpin, they were exhibited throughout the United States. The second floor contained more public rooms: the men’s writing and lounging room, a café, the main dining room with its crystal chandeliers, and the banquet room with its vaulted and groined ceiling. On the 25th Floor were the ballroom and roof gardens. That success, the magazine said, was due to the hotel’s hiring of “a number of dainty little American-born Chinese girls to serve as waitresses” as well as Chinese cooks. Until now, Chinese restaurants were considered decidedly middle-class; hotel restaurants traditionally served French cuisine. The little Chinese café was yet one more example of the hotel’s bold initiatives. Like so many other details in the McAlpin, terra cotta rose here to a new level. The Atlantic Terra Cotta Company used “ a new method of blending colors by running the glazes on the terra cotta, and the skillful handling of the juxtaposition of color,, results in a charming and novel effect quite new to the use of this material,” the article said. Terra cotta murals by artist Frederick Dana Marsh decorated the walls, depicting the maritime history of the city – responsible for the room’s renaming as The Maritime Grill. The space was sumptuous in color and design and created an other-worldly, fantasy setting. Two years after opening, the hotel owners enlarged. The two 25-foot wide lots at 46 and 48 West 34th Street were purchased and a seamless addition was constructed adding 200 more rooms and another ballroom. In 1922 the McAlpin became one of the first hotels to connect ship-to-shore radios into their telephone system so guests could speak directly to voyaging friends or relatives. Three years later a circular, glass-enclosed radio studio was installed and station WMCA was born from which, among other programs, the McAlpin Orchestra performed. “Only professional entertainers will broadcast, as it has been decided not to extend the use of the microphone to amateurs,” vowed the management. The hotel earned unwanted publicity when, on December 23, 1933, Cuban Congressman Armando Infante was beaten by two assailants in his room. 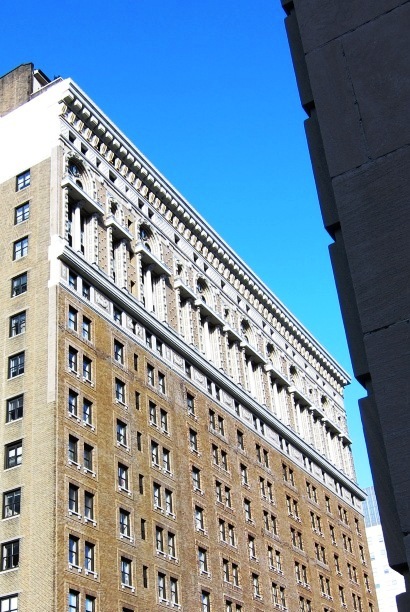 Jamlee Hotels purchased the building in 1938 for $5.4 million, spending another $1.75 million in renovations. 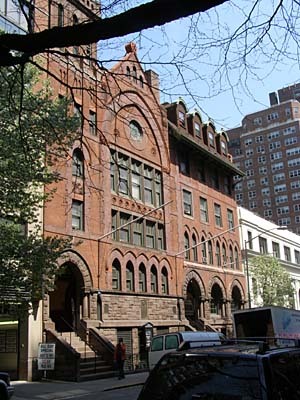 In 1952 Jamlee president Joseph Levy met the Tisch Brothers, Larry and Bob, at a cocktail party, according to the 2001 “Wall Street People,” and convinced them to lease the McAlpin. The Tiches spent $1 million to modernize and rehabilitate the hotel, resulting in a 20% increase in the occupancy rate and increased room rates. Within two years Levy sold the money-making hotel to the Sheraton chain for $9 million which renamed it the Sheraton-McAlpin and then the Sheraton-Atlantic. In the meantime, the unique Marine Grill had been closed for several years and sat vacant and dusty until 1960 when it re-opened as an unexceptional restaurant. 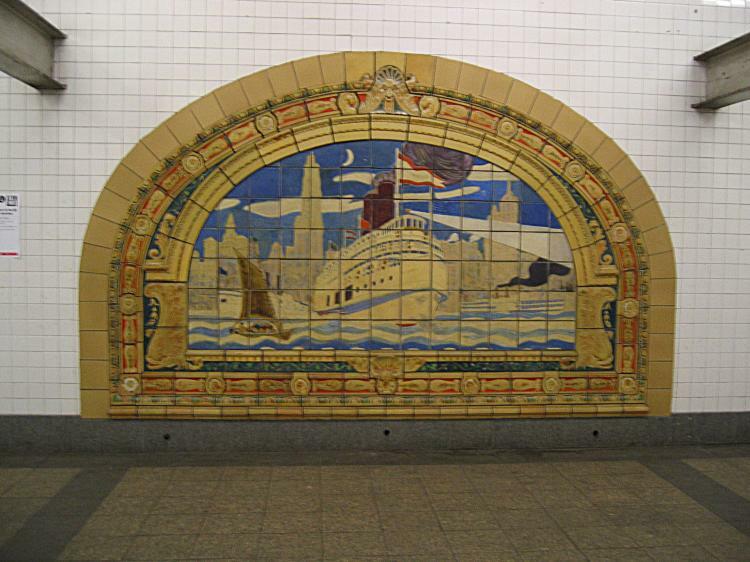 The astounding terra cotta décor remained intact, largely unnoticed, until the mid-1970s when a member of the Landmarks Preservation Commission stumbled upon it. Before long word-of-mouth drew architectural historians to the Grill to ogle the irreplaceable interior. Unfortunately, no one bothered to nominate the one-of-a-kind space for landmark status. The upper floors are ornamented in exuberant polychrome terra cotta. In January 1976 foreclosure proceedings were initiated against the hotel and in July it was purchased to be converted to 700 rental apartments. As the hotel emptied of guests, 30 elderly long-time residents refused to leave their apartments, causing a temporary delay in the plans. The building was renovated again in 2001 to condominiums, called the Herald Towers. From the street, Frank Mills Andrews’ terra cotta encrusted Hotel McAlpin looks much as it did on opening day 1912, a dignified and handsome structure. ﻿﻿In the years immediately following the assassination of Abraham Lincoln on the night of Good Friday, April 14, 1865, grieving communities across the nation initiated plans to erect memorials and statues to the fallen President. Among the first was New York City. The Union League Club started the ball rolling. In 1868 the Republican political organization began selling “subscriptions” to garner donations from the community to pay for the project. As the money flowed in, the Club commissioned sculptor Henry Kirke Brown to design the monument. Brown was well-known to New Yorkers, having produced the masterful equestrian statue of George Washington that stood at the south end of Union Square Park. The bronze statue was recognized internationally as among of the greatest of contemporary equestrian works. Brown’s efforts in depicting Abraham Lincoln would fall short of the mark in the public’s eye. By September of 1871 the monument was nearly finished. Cast by the Wood Bronze Company of Philadelphia, the statue had been completed a year earlier and carefully guarded from public view in a bonded warehouse on South Street. Weighing almost 3,000 pounds, it stood just under 11 feet tall. Brown had inexplicably chosen to dress the President in modern attire while wearing a Roman toga over his shoulder. In his left hand he held the Proclamation of Emancipation. New Yorkers gathered on September 17 as workers assembled the monument. The base of the monument, the largest stone ever quarried in the United States and weighing over 17 tons, was placed on the 9-1/2 square foot sub-base over a 5-foot deep foundation. A second stone, at 16,000 pounds, was topped by an 8,000-pound cap; forming a 24-foot high pedestal for the statue. The gray granite blocks from Dix Island, Maine had been highly polished and etched with 36 stars representing each state of the Union during the Lincoln administration. And then the statue was erected. The article lambasted Brown’s choice of Lincoln’s clothing. “The mind has not conceived such a pair of pantaloons as that which the artist has put on this statue...the designer of the work has clapped a Roman toga over the upper part of the figure, thus combining the costume of the past and the present in a manner never yet dreamt of by caricaturists. “There never was such a statue done in this world before. It is like the hideous nightmare which people have after supping on roast pork and lobster salad,” the writer complained. The newspaper offered to accept subscriptions to remove the statue and ship it to Chicago where “works of art of this kind are highly appreciated.” It further warned nurse maids to avoid that area of the park, lest the children in their care might mistake the statue for the bogeyman. Despite the artistic condemnation, the statue was the site of speeches and celebrations for decades. Flowers adorned the memorial every year on Decoration Day (now known as Memorial Day). In 1877, for instance, with the memory of the Civil War still vivid, the Lincoln statue was the most decorated in the park. A laurel wreath was placed on Lincoln’s head, the statue was wound with sprays of wisteria, begonias and greenery; while a panel spelled out “Emancipation” in white carnations. 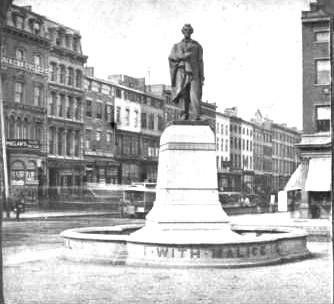 Both the Washington and Lincoln statues sat on triangular traffic islands created by the oval-shape of Union Square. When they were erected, the park was surrounded by elegant brownstone mansions that created a pleasing backdrop for them. 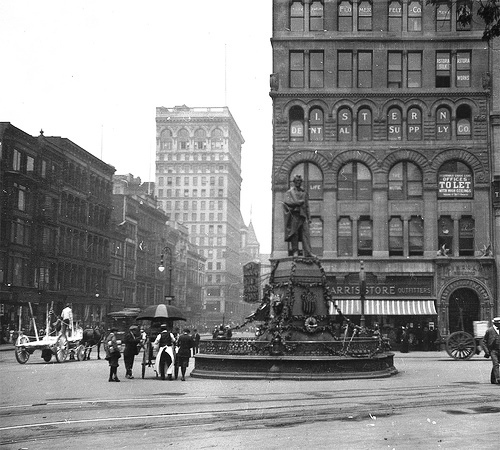 A plan to renovate Union Square that included moving the statues was proposed. Although the Washington statue sat on the spot where, reportedly, New Yorkers acclaimed the general on Evacuation Day, November 25, 1783 and had stood in its original spot longer than any other statue in the city, the plan was approved. The two statues were repositioned in a straight line down the middle of the park – Lincoln at the north end facing south, Lafayette in the middle and Washington at the southern tip. 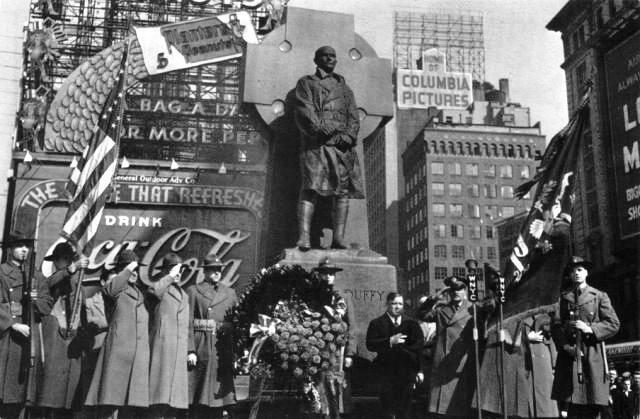 Reminiscent of the speeches and celebrations centered around the Lincoln statue in Victorian times, a ceremony was held here on February 12, 1942 by New York veterans and Boy Scouts. Sparked by the surprising and demoralizing news of German and Japanese victories, “Lincoln Day” was intended to rally patriotism and optimism among citizens nationwide. One Chinese-American boy scaled the pedestal to lay a wreath of flowers forming a “V” for victory at Lincoln’s feet. By 1955 Lincoln had seen better days and The New York Times deemed it “weatherbeaten.” The statue was completely restored in 1992. Today Brown’s Abraham Lincoln stands stoically on its pedestal staring southward towards the much more famous George Washington. While no longer maligned, it is more often simply overlooked. Henry Cook's house, at left, melds seamlessly with Payne Whitney's bow-fronted mansion next door. Henry H. Cook made his fortune in railroads and banking. 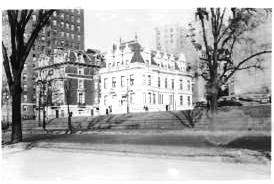 When he began planning to build his enormous mansion in 1880 at the north corner of 5th Avenue and 78th Street across from Central Park he had no intentions of commercial interlopers in his neighborhood. 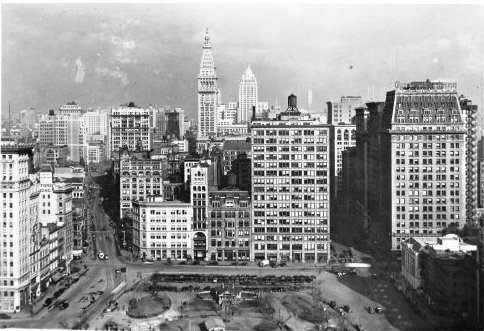 That year Cook purchased the entire block from Fifth Avenue to Madison Avenue, between 78th and 79th Streets for $500,000 and laid out stringent building restrictions: no structure other than a private home could be built on what was known as the Cook Block. The restrictions survive today. Cook commissioned architect William Wheeler Smith to design his great stone palace, completed in 1883. In 1898 the block would be balanced by the erection of Isaac D. Fletcher’s great French chateau on the 79th Street corner as Cook’s dream of filling his block with elegant mansions took shape. 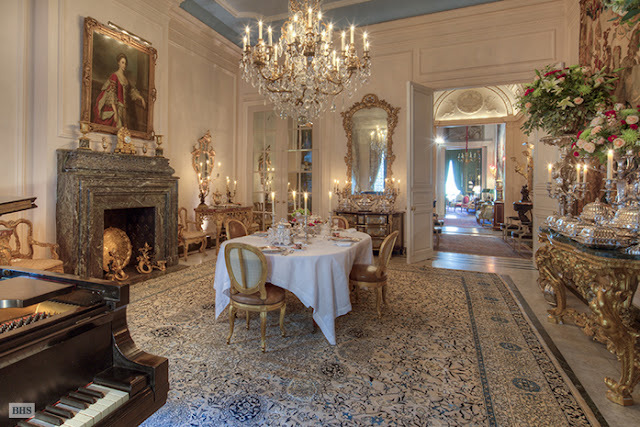 In 1902, perhaps deciding to downsize as he grew older and with his daughters grown, Cook called upon the esteemed firm of McKim, Mead and White--at the time the foremost architects in America-- to design an elegant townhouse next to the Fletcher mansion. 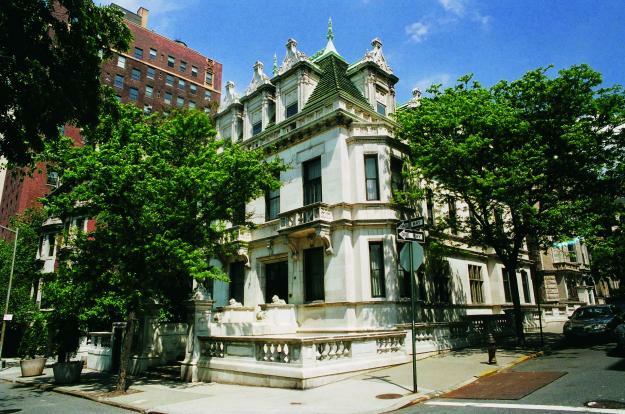 Stanford White took charge of the project, designing alongside it a nearly-matching bow-front residence for the wealthy Payne Whitney. Whitney produced two Italian Renaissance palazzi that flowed together so harmoniously that they are often mistaken for a single residence. White skillfully disguised the six stories above ground to appear as four. Elegant double wooden entrance doors were slightly recessed in a rusticated base above three broad steps. Paired Corinthian columns separated the second floor windows, mimicked in pilasters at the third and fourth stories. A deep cornice supported by paired brackets swept the roof line. Cook was known internationally for his art collection of paintings and statues. Yet he would never see them displayed in his new Italian-style home. Like Cook, the architect would not live to see the finished product. A year after Cook’s death, Harry Thaw was enraged with jealousy over Stanford White’s physical affair with Thaw’s wife, Evelyn Nesbit, and fatally shot the architect on the roof garden of Madison Square Garden. The Cook and Whitney houses were completed in 1907. By 1912 James B. Duke had demolished the original Cook mansion to erect his own white marble mansion that survives today. Mrs. Feder continued to entertain lavishly in the house until her husband’s death on May 11, 1944. She sold the mansion in 1948 to the Church of the Latter Day Saints. Here prospective missionaries were schooled in the art of conversion. While other great mansions along Central Park were being converted to museums or condominiums, the Cook house remained intact. In 1977 it was purchased by highly-successful businessman Victor Shafferman for $600,000. Shafferman died in 2009 leaving No. 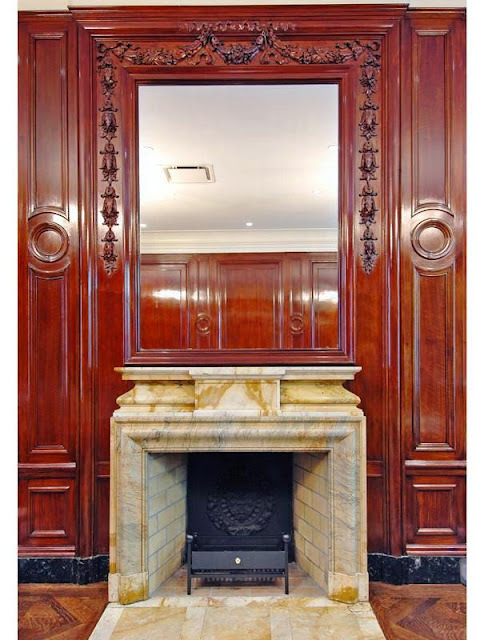 973 Fifth Avenue with much of the original interior detailing: plaster moldings, marble mantles and paneled rooms. 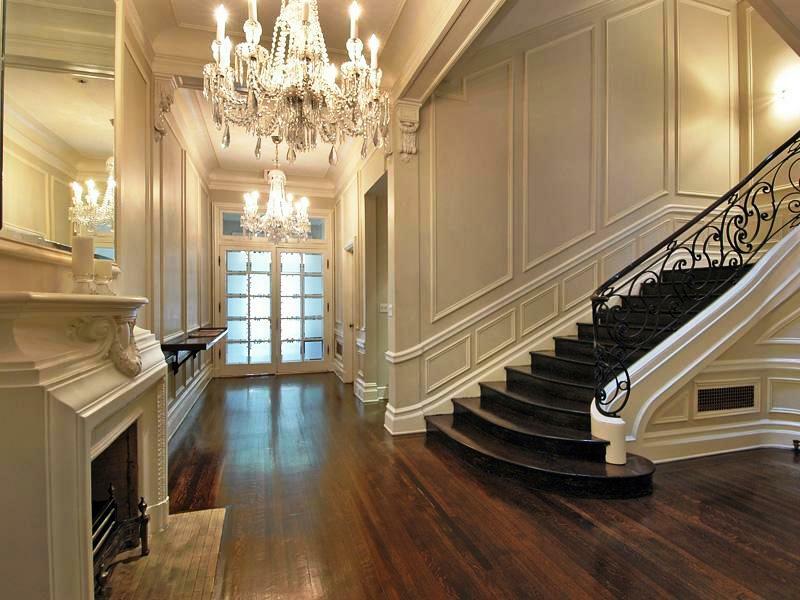 In 2011 the 15,000 square foot private residence was put on the market for $49 million. The remarkable home which neither Henry Cook nor Stanford White lived to see completed is a rare intact survivor of the Gilded Age of Upper Fifth Avenue.